Lakeview Regional Medical Center, a campus of Tulane Medical Center is being recognized nationally for its 24/7 neurology coverage and stroke protocols. A stroke patient loses 1.9 million neurons each minute stroke treatment is delayed. This recognition further demonstrates our commitment to delivering advanced stroke treatments to patients quickly and safely,” states Dr. Dr. Frieberg, Neurology Chair. Lakeview Regional Medical Center, a campus of Tulane Medical Center is being recognized nationally for its 24/7 neurology coverage and stroke protocols. 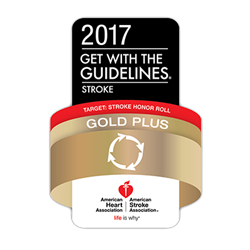 The latest recognition is coming from American Heart/American Stroke Association Get with the Guidelines, who has bestowed the prestigious Stroke Gold Plus Quality Achievement Award with Target: StrokeSM Honor Roll Elite on Lakeview. This award recognizes the hospital’s commitment to providing the most appropriate stroke treatment according to nationally recognized, research-based guidelines based on the latest scientific evidence. This marks the 3rd year Lakeview Regional has been recognized with a stroke quality achievement award. “I’m so proud of the hard work of our medical staff and employees to earn this award. It’s been a three-year journey to reach this level. We often see smaller and larger hospitals transferring their patients to us because of our outstanding stroke program,” states Bret Kolman, CEO Lakeview Regional Medical Center. Lakeview Regional has also met specific scientific guidelines as a Primary Stroke Center, featuring a comprehensive system for rapid diagnosis and treatment of stroke patients admitted to the emergency department. “The American Heart Association and American Stroke Association recognize Lakeview Regional Medical Center for its commitment to stroke care,” said Paul Heidenreich, M.D., M.S., National Chairman of the Get With The Guidelines Steering Committee and Professor of Medicine at Stanford University. “Research has shown there are benefits to patients who are treated at hospitals that have adopted the Get With The Guidelines program.” According to the American Heart Association/American Stroke Association, stroke is the No. 5 cause of death and a leading cause of adult disability in the United States. On average, someone suffers a stroke every 40 seconds, someone dies of a stroke every four minutes, and nearly 800,000 people suffer a new or recurrent stroke each year. Get With The Guidelines–Stroke program helps hospital teams provide the latest, research-based guidelines with the goal of saving lives and improving recovery time. Get With The Guidelines®-Stroke has impacted more than 3 million patients nationwide since 2003.